WIESBADEN, Germany — Driving on the roads in a foreign country where you don’t speak the language fluently can be nerve wracking enough. But imagine getting pulled over by police. That’s what happened last month when Tony Muñoz, a Department of the Army civilian living in Wiesbaden, was on his way back from a trip to the Netherlands. Muñoz was pulled over just across the border in Germany by an unmarked car that pulled in front of him and flashed signs that read “Polizei” and “Bitte folgen” (Please follow). He knew right away what to do and found a safe place to stop. Law abiding drivers who are pulled over by police in Germany should have no problems and will likely be sent on their way promptly, as was the case with Muñoz. But it pays to know what to expect and what documents to have on hand to make the process go as smoothly as possible, police said. A lot of people see the blue lights and panic, said Sgt. Joseph Onessimo, a traffic officer with the Directorate of Emergency Services. But police officers want to emphasize the importance of slowing down and focusing on safety. “We want people to stop at the next possible safe location,” Onessimo said. Polizeihauptkommissar Stefan Heinz, an instructor at the HFPV (University for Police and Administration) said that while getting pulled over in Germany is a bit different from the U.S., what drivers should do once they stop is the same; turn off the engine, remain inside the vehicle, keep hands visible/on the steering wheel and wait for instructions before looking for documents or taking any action. 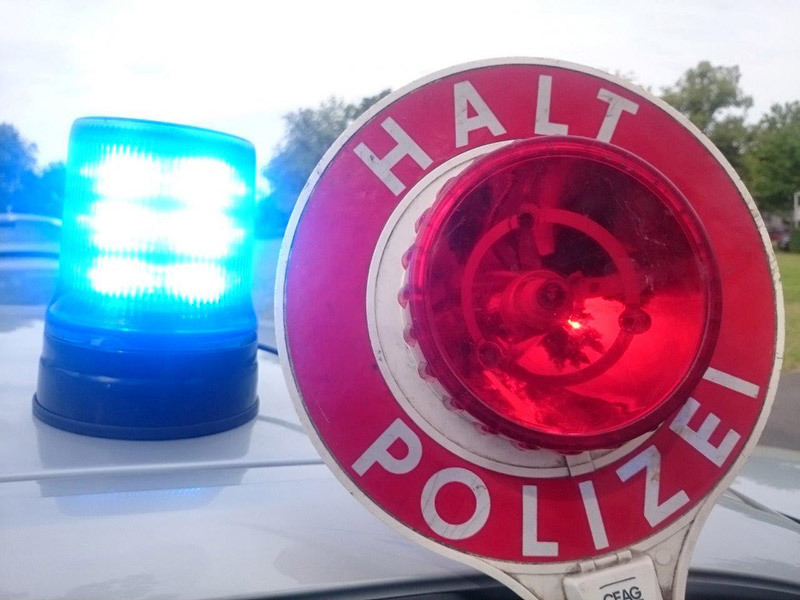 Polizei officers will identify themselves and state the reason for the traffic stop. It is important that drivers let the officer know right away if they do not understand German. The vast majority of officers will be able to communicate in English, Heinz said. It may be helpful, however, to keep the garrison military police phone number on hand in the rare case that communication is limited or a driver feels their rights are being violated. All police in Germany have their respective contacts at each garrison, said Thomas Fink, Wiesbaden Police Directorate Deputy Director. So Polizei will be able to get in contact with Military Police, if necessary. If a person identifies themselves as a police officer, but they are dressed in civilian clothes, drivers can ask for identification to show proof that they are who they say they are, Heinz said. The officer will then check the driver for proper documents and may do a quick inspection to ensure that lights are working and that the driver is in possession of a safety vest, warning triangle and first aid kit, he said. “Keep the proper documents with you in your car, and as long as you follow the proper rules of the road, there’s really nothing to be worried about,” Onessimo said. Another thing to note about traffic stops in Germany is that two officers typically ride in a car. One officer will communicate with the driver and the other will stand watch to keep the situation secure and may have a machine gun, Heinz said. Certain routes are known criminal routes, so drivers may be pulled over simply for being on that route, he said. And police may use drug- or money-sniffing dogs.